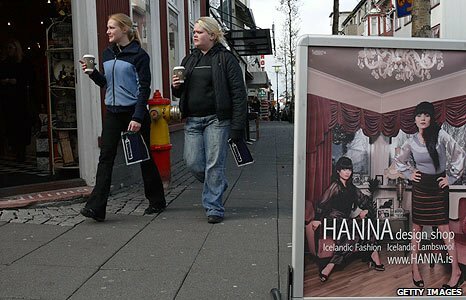 BBC News - Could Iceland be a model for debt-ridden Europe? Could Iceland be a model for debt-ridden Europe? Nearly three years after the Icelandic economy imploded, the country appears to be recovering, and some believe its approach may offer a possible solution to Europe's debt problems. Iceland does not seem like a country in the grip of a crisis. On my first day the sun was shining brightly and out in Reykjavik's main shopping area the shops and boutiques, the cafes and restaurants were busy. Indeed, Reykjavik seemed pretty much like any other prosperous northern European city. Yet Iceland was hit hardest by the credit crunch in 2008. Its current recovery is why Iceland is being held up as the model for an alternative way to deal with the debt that plagues so many economies. That is because when Iceland's banks went spectacularly bust, instead of pouring in billions of taxpayers' money to shore them up, Iceland just closed them down. Their debts were so huge that, in truth, the country had little choice. Nevertheless, it was a radical strategy. Iceland effectively said "stuff you" to the banks' creditors. Foreign debts were written off - including $8bn (£4.9bn) of deposits from savers in the UK and Holland. "Bankrupting your way to recovery," it has been called. Iceland's president is certainly convinced the strategy is working. 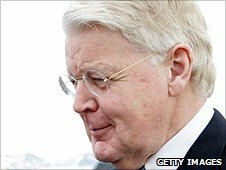 Olafur Ragnar Grimsson reels off a series of impressive economic statistics when I meet him in his stark mansion on a forbidding spit of land jutting out into the bay outside Reykjavik. He tells me how the economy is now growing faster than that of most other European countries and with a lower public sector deficit. Unemployment is falling and Iceland has just raised a billion dollars at favourable rates on the international market. But Iceland's approach is about much more than just getting its banking sector in order, the president tells me. It is also about affirming the will of the people over the financial institutions. "In Europe there is a conflict between the democratic will of the people and the interests of the financial markets," he tells me earnestly, leaning forward over his antique desk. 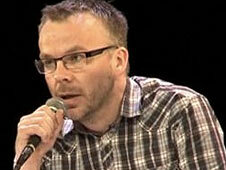 He believes if Europe is not about democracy then the European project means nothing. Iceland ignored the dire warnings of disaster from the ratings agencies and other institutions, says the Icelandic president, and the country is doing OK. The implication is clear - other countries should follow the Icelandic example. But Iceland had a key weapon in its armoury that is not open to the indebted eurozone nations - Iceland had its own currency, the krona. And, when the banks collapsed, the krona did too. That is a key reason why Reykjavik is now so busy. Prices have effectively halved for most tourists. From being one of the most expensive cities on earth, Reykjavik has become, well, just a bit pricey. But, as Gunnar, the taxi driver who drove me back from the presidential mansion explained, the collapse in the krona has cost many Icelanders dear. Virtually everything here is imported and when the currency devalued, prices for everything from cars, to building materials, to food, soared. And at the same time wages fell. 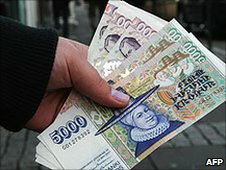 It has been a very painful squeeze, Gunnar says, made considerably worse by the fact that during the boom years many Icelanders were encouraged to take loans in foreign currencies and now they have doubled - sometimes even tripled - in value too. "I'll never pay my loans back," Gunnar tells me. "Better just to walk away from it - let them have my house." Gunnar seems resigned to the loss but he is just one of thousands of Icelanders in a similar situation. In a modest office on the outskirts of Reykjavik I met another of them, Guomundur Andri Skulason. He is much less sanguine than Gunnar. He set up an Association of Debtors to fight for debtors' rights. Mr Skulason quotes central bank figures showing that 25,000 households are in arrears on their debts - that is nearly a quarter of all households in Iceland. Last March the minister of finance put the figure at more like 40% of households, he tells me. Mortgages and other loans are a huge part of the assets of the new banks that Iceland formed out of the wreckage of the old. Mr Skulason believes that when the Icelandic people realise that they can never pay off their debts they will - like Gunnar - just walk away from them. Then the real reckoning will come. "Don't believe that Iceland has escaped its problems," he says. "This country and its banks are still bankrupt." Back in town I wander up a windswept hill in the centre of Reykjavik to look at the magnificent statue of Ingolfur Arnarson, Iceland's first settler. He stands tall in full Viking regalia up against the prow of his longship, a huge sword by his side. Once he would have had a clear view away over the fierce waters of the north Atlantic, out towards the coast of Greenland. Not any more. The mighty Viking now stares down upon a square black fortress of an office block. This ugly building houses the Icelandic central bank. It seems that, despite Iceland's best efforts, there is no easy way to escape the debt trap. Ingolfur's Viking vigil over the central bank is, I reflect, perhaps more appropriate than it first seems.